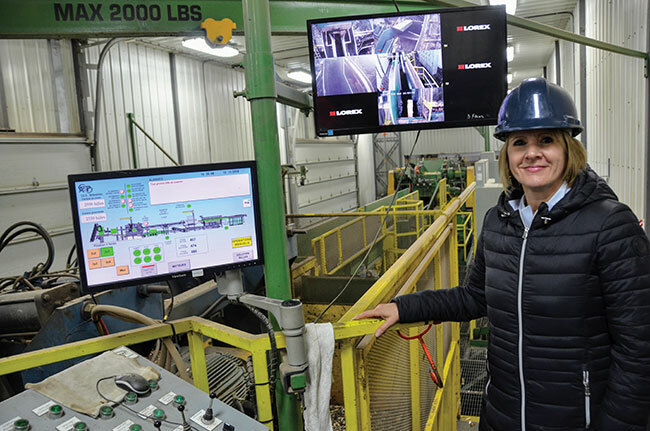 Manon Simard, general manager of Scierie Lac-Saint-Jean sawmill in Métabetchouan-Lac-à-la-Croix, Que., says the addition of a small-log sawline is helping the mill maximize wood yield and productivity. Since 2014, Scierie Lac-Saint-Jean sawmill in Métabetchouan-Lac-à-la-Croix, Que., has invested $10 million to process more wood while also creating more value. “Our wood supply has gone from 150,000 cubic metres to nearly 200,000 cubic metres,” says general manager Manon Simard. Key to the volume increase was the addition of a small Inotech sawline, built with parts from an existing Sawquip line. But the journey to get the project off the ground proved long and difficult for the mill. It all started when the company acquired a small Sawquip sawline in 2008, right in the thick of the economic downturn. The equipment had to be put in storage while the economy struggled to recover. The company didn’t want to make any further investment, specifically facility upgrades, during such a slow period. To ride out the storm, Scierie Lac-Saint-Jean began exporting to markets underserved by Quebec. It sent some of its wood to the Middle East, with the help of Almassa, a Montreal-based international marketing agent. “During the crisis years, we adjusted our production to be able to ship more wood to Egypt or Saudi Arabia,” Simard says. The company still exports nearly five per cent of its products to the Middle East. The mill waited until 2014 – at a time when wood supplies were being re-negotiated – to re-start the small sawline project. With a certain basic supply of 160,000 cubic metres, and some 35,000 cubic metres of wood purchased at auction, the company decided to forge ahead with the upgrade. The mill chose to work with Inotech, a long-time partner that had refurbished its main sawline in the past. Scierie Lac-Saint-Jean pre-sorts its logs in the yard by diameter: four, six and eight inches. 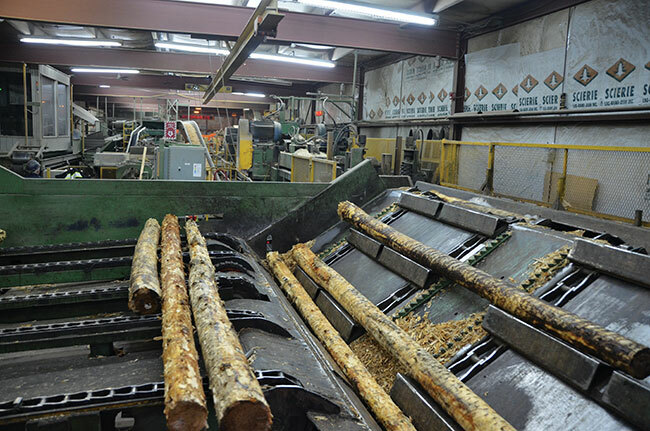 Logs are processed by batch, rotating between diameters every few days. “The main sawing line was used roughly 20 per cent of the time to process small logs, which wasn’t cost-effective,” Lévesque says. 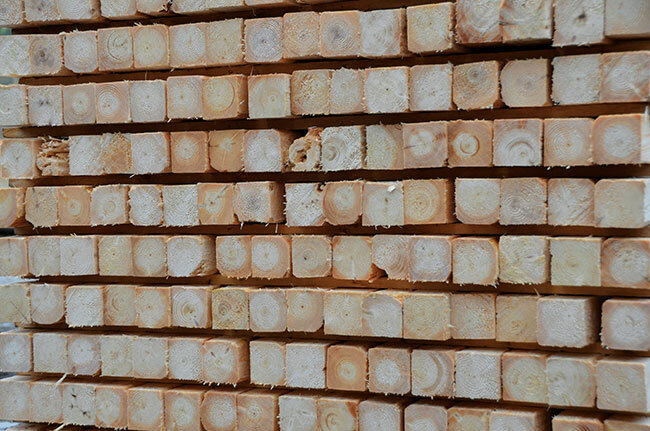 Adding a small sawline helped the mill maximize wood yield and productivity, mainly owing to increased production of 3x3s, a product used for making pallets, Simard says. Apart from its small size products, the sawmill also produces 2x4s, as well as a small volume of 2x6s and boards. The production of new products meant adding two more bins to the Inotech sorter installed in the early 2000s. Inotech also took the opportunity to install its air-bag activated tipples. “The system consists of two small air bags that activate the tipples instead of a cylinder or a pneumatic rotator. This reduces downtime since the pads don’t need any maintenance,” Lévesque says. The new sawline has allowed Lac-Saint-Jean sawmill to increase its wood supply from 150,000 cubic metres to nearly 200,000 cubic metres. The feed positioning system on Inotech’s CCS series single-pass canter line allows the mill to handle logs without having to straighten them, which means they can produce 2x2s or 3x3s without warp. Close to 80 per cent of Scierie Lac-Saint-Jean’s lumber is sold dry. For several years, drying and planing were contracted out to other companies in the region. “Over the past few years, we had it done outside the company in Quebec. To create more value closer to home, we decided to acquire a planer mill in Hébertville in 2016,” Simard says. Located about 22 kilometres away from the sawmill, the Hébertville planer mill has a 45 mmbf capacity since being modernized by Scierie Lac-Saint-Jean. The company began upgrades at the planer with a VAB Solutions sorting system, which has made it possible to “greatly improve sorting and recovery potential,” according to Simard. After spending the summer processing a lot of fir, which represents about 35 per cent of its supply (65 per cent black spruce), the mill was busy installing an MSR grading system, also provided by VAB Solutions. The acquisition enabled the company to increase the value of some of its products by five to 10 per cent. “We think we can get added value on close to 50 per cent of our production. It will be profitable especially during more difficult periods, since everything is in demand when markets are doing well,” Simard says. This is a well-timed project given the decline in lumber prices seen over the past several months. Barely five months after the purchase of the planer site, the company was forced to renovate the kilns after they suffered major damage due to a fire. As a result, the boiler that ran on wood shavings was replaced with a Cathild natural gas-fired kiln. The kilns were rebuilt and a heat recovery system was added. “Operations are now simpler and we reduced our operating costs,” Simard notes. Although rough lumber is sold directly by Scierie Lac-Saint-Jean, the regional company works with wholesalers such as Bois du Fjord, which sells products mainly in Ontario and the rest of Canada. Recently local automation experts ASP installed several automation systems throughout the mill, which has meant unprecedented access to production data for employees. “We are on track to get even more information to move to an industry 4.0 model, while refining our work methods,” Simard says. The total $10-million investment in the mill has been a four-year project, and now the family business, built by Jean-Guy Simard, will spend some time fully capitalizing on the improvements. That said, the company has already set its sights on the next investment. Since adding products to the planer line, the planer mill will require new bins and a better sorting system, which, at the moment, is a labour-intensive job. To grow the business, Scierie Lac-Saint-Jean is also looking into the possibility of implementing a second shift. “Over time we need to develop a new strategy to find more wood and to train our people,” Simard says. Since starting up back in 1980, the family business now has two facilities that employ about 60 people, with a similar number working in the woods.